Our 72 rooms and suites offer comfort and serenity combined with modern amenities, whether travelling with family, friends or for business. 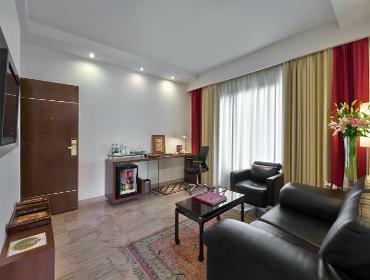 Park Regis Jaipur aims to provide you with all the amenities required to create a home away from home during your visit. Take a dip in our marvelous outdoor swimming pool or condition yourself in the Fitness Centre. Park Regis Jaipur offers international standard meeting, banquet and conference facilities to suit all your meeting and events needs. Our banquet halls can accommodate events up to 130 guests, whereas our lawns can cater up to 500 guests. Distance from Jaipur International Airport is 18 km, distance from Jaipur Railway Station is 7.5 km and distance from Sindhi Camp Bus Stand is 6 km. 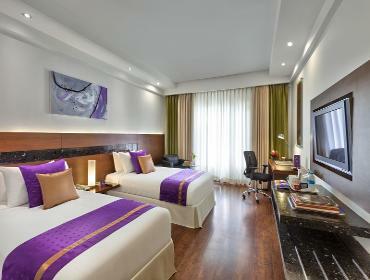 At Park Regis Jaipur our aim is to provide you a home away from home feeling. 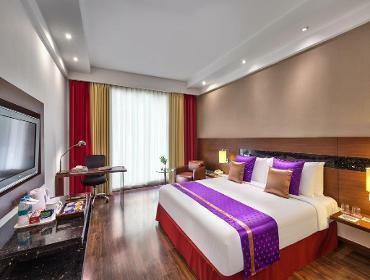 With our convenient location, international standard facilities and warm service we always aim to make your stay worth remembering. Park Regis Jaipur offers a wide range of gastronomical delicacies. Situated at the lobby level, Aangan our Indian Speciality Restaurant serves you with the best of Indian and Rajasthani cuisine. Aangan operates during lunch and dinner. Situated at the lobby level, Palms – Coffee Shop And Bar, offers you with the best of dishes around the world. It also offers a diverse range of imported and Indian spirits. Palms operates from 6am to 11pm. You may like to relax yourself in the evening with soothing Jaltarang music and puppet show.